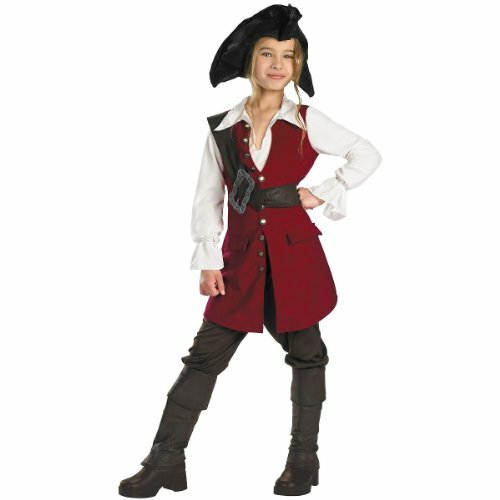 This Elizabeth Pirate Deluxe Costume features a shirt, vest, pants, across-the-chest belt with buckle, boot covers and hat. Toy weapon sold separately. 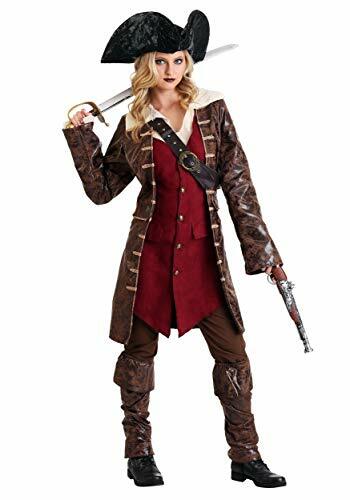 If youâ€TMre looking to become a sassy pirate, this Elizabeth Swann Teen Pirate Costume is what you want. Look for a sword in our accessories section and youâ€TMll be ready to set sail with Will and Jack on their next adventure at world's end! 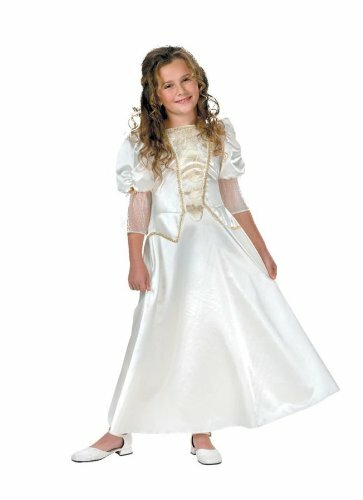 This Elizabeth Pirates of the Caribbean costume includes a long dress with gold trim and sheer half sleeves. This Pirates of the Caribbean costume comes in child sizes X-Large, Medium, Small, Large. This Pirates of the Caribbean costume is an officially licensed Pirates of the Caribbean costume. Please note: This item's color may vary due to inherent manufacturing variations or your computer monitor's color settings. The item you receive will be identical or substantially similar to the item pictured in this listing. 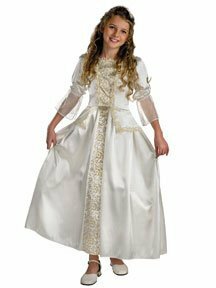 This Elizabeth Pirates of the Caribbean costume includes a long dress with gold trim and sheer half sleeves. The Pirates of the Caribbean costume comes in child sizes X-Large, Medium, Small, Large. This Pirates of the Caribbean costume is an officially licensed Pirates of the Caribbean costume. Please note: This item's color may vary due to inherent manufacturing variations or your computer monitor's color settings. The item you receive will be identical or substantially similar to the item pictured in this listing. Feel and look like royalty in this elegant gown fit for a Queen. 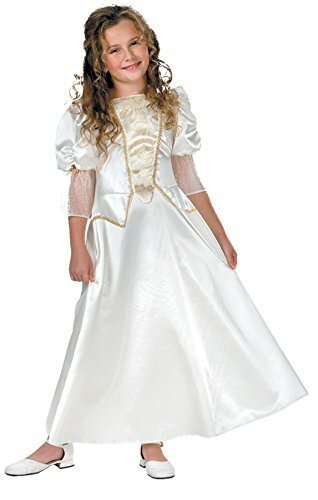 This deluxe costume includes a character-inspired dress with ornate detail down the center of the dress from top to bottom and sheer quarter sleeves. A great Halloween costume! The Leg Avenue Caribbean Pirate 2-Piece Costume includes a gold trimmed dress with attached belt and matching pirate hat with attached scarf. Open up your little one's imagination with this Caribbean Pirate Child Costume. It comes with a striped pink and black skirt, a pirate top and a pink sash. In addition, this pirate girl costume also features a matching bandana to wear around the head. The ensemble is specifically sized to fit a child girl. This pirate Halloween costume is ideal for trick-or-treating, school plays and character reenactments. Your little one will enjoy dressing at costume parties, parades and other holiday productions as well. It is easy to clean and is made out of polyester for soft and comfortable feel. You can create a custom look by adding shoes, black tights and other matching accessories (sold separately) to complete your little one's ensemble. The Caribbean Pirate Child Costume is sure to make your kid stand out this season. You'll look like Johnny Depp's body double when you wear this Realistic Caribbean Pirate Costume! This is an authentic looking pirate costume for men that is very reminiscent of Depp's character Jack Sparrow in the popular movie franchise, Pirates of the Caribbean. Start practicing your pirate squawk and get ready to set sail on The Black Pearl while you are wearing this high-quality costume. Now pass me the rum! Looking for the perfect pirate costume, matey? The Boys Caribbean Pirate Costume will make you look like a real swashbuckler! Put on the black head scarf, black and white shirt with attached vest and arm ties, and brown belt and get ready to pillage the neighborhood for candy! Arghh matey, you will be swashbuckling in this very cool Jack Sparrow costume.